Have you ever tried to cut the grass with a lawnmower and draw something interesting with it? Make sure you press the button in the right time and get what you need. When the regular hobbies are not interesting anymore the heroes of the Regular Show have fun doing completely different things. What about cutting the lawn with a powerful lawnmower? Your grass has grown high, so it's time to shape it the way you like! 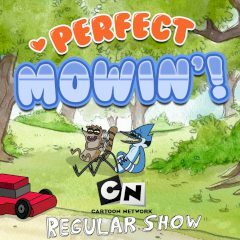 Games Similar Regular Show Perfect Mowin'!